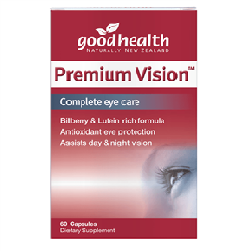 Good Health Premium Vision Eye care supports Eye health with important antioxidants, herbal extracts, vitamins and minerals. Betacarotene, lutein and Vitamins C & E all provide specific eye benefits, and the minerals zinc, selenium and chromium are vital for healthy eye function and preventing damage to the eye. The herbal extracts Bilberry and Ginkgo provide natural support against age-related eye problems and eyestrain.